Roque de los Muchachos Observatory near the highest point of the race course. This weekend, I got to check another race off my bucket list. Work had me traveling to Barcelona, Spain this week. I was able to extend the trip by a couple of days to participate in the 2018 edition of the Transvulcania 74K on La Palma island part of the Canary Islands of Spain off the coast of Africa. What at first appeared to be just a short domestic flight within Spain ended up being more like the movie "Planes, Trains and Automobiles". I am exaggerating slightly here, but planning the travel was actually more challenging than the other planning and actual training for the race. The start line of the 2018 Transvulcania 74K. While Transvulcania has only been around for ten years, it has quickly developed into one of the premier ultra mountain races in the world, becoming a bucket list race for many ultra runners, including myself. Obligatory selfie at the start line. The race takes place on the island of La Palma. Over the course of 74 kilometers or 46 miles, runners climb more than 4,400 meters or 14,400ft. The spectacular scenery of volcanoes and cauldrons and running through various climate zones below and above the clouds coupled with unparalleled spectator support make this a race equalled only by the likes of Ultra-Trail du Mont-Blanc in France and the actual equivalent in cycling, the Tour de France. Don't believe me, go check out videos of this year's Transvulcania. The crowd support is unreal, making the race atmosphere truly electric. Massive excited crowd of nearly 2000 runners awaiting the countdown to the race start. Since I was working in Barcelona the week prior to the race, I did not make my way to La Palma until Friday evening. I was able to find a direct flight from Barcelona to Tenerife followed by another flight to La Palma, where I picked up a rental car to drive to an awesome apartment that I found through an online hotel search site. A first glimpse of the sun as we break through the clouds for the first time. My apartment was located just down the street from one of the hotels service as race HQ. I made it just in time to pick up my race bib along with some great race swag, a tech shirt, a small backpack and some other items. Picking up my bib, I ran into Ian Corless, race photographer and podcaster extraordinaire, whose podcast had turned me on to both the Everest Trail Race last November and Transvulcania, and Becks Ferry, who has also run the Everest Trail Race and was here to run the marathon distance. The world of mountain and ultra running is a small world, indeed. Next, I had to figure out what and where to eat. It isn't always easy to find vegan food choices. I ended up finding a salad, pasta, veggies, bread and an ice cold beer to serve as pre-race fuel. My 9PM, I had laid out my running kit and mandatory gear for the next morning. My alarm was set for 2:30AM in the morning to allow me to catch one of the shuttle busses scheduled to leave for the race start at 3:30AM. This would allow me enough time to take a shower and tape my heels on race morning. These views never got old, running above the clouds. I fell asleep by 10PM and just after midnight, I was awake again, bummer. I stayed in bed trying to go back to sleep, but i just ended up lying there and tossing around. I got up at 2:30AM as intended and got ready. By 3:15AM I walked out the door and to the shuttle stop. Hundreds of runners were already lining up for the busses. By 3:30AM, I was on my way. We made our way along winding roads climbing around, up and over the island on our way to the race start at the lighthouse on the southernmost point of the island. Running across one of the many "saddles" between mountains. When we arrived an hour ahead of the 6AM race start, the wind was whipping at 40-50 miles an hour. Folks were huddling behind the lighthouse to stay out of the wind and to prevent getting smacked around by fine lava sand. I actually pulled my windbreaker hood over my head and my buff up and over my nose and ears to keep the sand out. The terrain varied all day, from sharp lava rocks, to soft deep lava sand to large rocks. As runners were funneled to the actual starting line by the cliffside and jus below the lighthouse, race officials were checking every runner's mandatory gear before letting us proceed. After getting checked, I managed to take a quick selfie along with some pictures of the crowd that was waiting in anticipation. The race start was more evidence of the professionalism of the race organizers. Runners making their way up one of the many climbs. The race announcers got the runners going and kept the excitement building all the way to the actual start of the race. Even now, I still get goosebumps just watching videos from the race start again and again. The atmosphere was electric. When the race finally got underway, a human wave pushed forward and through the start line arch with 100 or so elite runners leading the charge. Just above the lighthouse, a large fireworks display added to the excitement. It was insane! I was stuck somewhere in the middle of the field, determined to work my way forward whenever given the space to do so. Never ending train of runners making their way. The 6 AM race start meant that we would require the use of headlamps for the first hour of the race. Race organizers also required runners to have a red flashing light attached to our rear for visibility. Both the headlamps and the red tail lights made for a spectacular scene as runners snaked their way up the first major climb. The trail of lights went on for more than a mile. Above the clouds with the largest of the Canary Islands, Tenerife, visible in the distance. Less than 10km or 6 miles into the race, we arrived at our first checkpoint in the village of Los Canarios. I thought I had arrived at the finish line. Daylight had barely broken and here were these spectators, hundreds lining the streets with cowbells, cheering on every single runner like a rockstar. Most farming and villages on the island are located near the coastline. Throughout the race and whenever one would hit a low point, if that's even possible on a race course like this, spectators would be there to lift up runners. No spot seemed too remote for folks to be there to cheer for runners. Catching a glimps through the clouds. Knowing that lots of runners would use trekking poles at this event, I had brought them along on the trip. However, I decided the night before the race to not take or use them. I didn't think the cumulative elevation gain required poles. I knew it would be challenging for sure with the course climbing 14000ft over the first 34 miles, but I didn't think I'd ned poles. As it turned out, I didn't. I was moving well enough and my legs and feet felt ok all day. Nutrition, on the other hand, was a different story. Large sections of trail and the surrounding terrain consisted of varying forms of lava. I moved steadily along the course, hiking what I had to and running what I could. The race started cold and windy and continued that way into and through the cloud cover. As the day wore on, temperatures continued to climb, especially above the clouds, where we spent much of the day. While I was initially excited about the warm up, but it silently wore me down. The initial cool temps coupled with the climbing followed by the warmup took their toll on me. Clouds creeping across a gap in the mountains. While I was carrying literally one pound of gels, I opted not to carry any drink mix and just grab the aid station fluids for additional nutrition and hydration. That was a mistake. I only took fruit from the aid stations (to adhere to my vegan diet) and the drink served was either water, some type of lemonade and Powerade, neither providing me with the nutrition necessary to sustain the appropriate effort. View of a caldera rim from the distance. By the time I arrived at the highest point of the race course around mile 34 near the island's observatory, I knew I had to change something. When I checked into the aid station, I stumbled around for a bit until I decided on a course of action. I noticed some runners eating pasta with vegetable sauce. While nothing really appealed to me at this point, I knew I needed calories badly, so I sat down for 20 minutes to eat. After 20 minutes and a quick stop in the bathroom I finally trotted out of the aid station, rather slowly at first. We spend lots of time running in the clouds. After about 10 minutes of walking and getting passed by runner after runner, I actually started to feel better. I knew we had a serious descent ahead of us, about 10 miles with 8,000ft. I knew my quads could take the beating. I was only worried about my energy and my feet. Thankfully, I was able to keep both in check and by the time I arrived at the top of the final switchback descent to Tazacorte, I had made up most of the spots I had lost and could hear the race announcer below keeping the crowd pumped as marathoners reached the finish line and ultra marathoners passed through their final checkpoint 3 miles from their finish in Los Llanos. The climbs seemed endless, but manageable. When I arrived in Tazacorte, I could definitely "smell the barn". I was ready to refuel and charge on to the finish. The next section took us along the beautiful black beach of Tazacorte before running in a dry river bed that turned into a narrow gorge before runners started the final climb to Los Llanos and the finish. Again, I started to pass some runners as I was itching to finish. When I crested the last climb, I turned onto the final stretch of the race, a 3/4 mile straight leading runners through town and past tourists and spectators before running down the finish line chute on a red carpet and among the cheers of a massive crowd. I'm sure more than just one runner heard "Chariots of Fire" playing in their heads as they high five'd spectators running across the finish line. The views were spectacular in every direction. When this moment finally happened for me, I crossed the finish line in 11 hours and 11 minutes. While this is an hour slower than my original goal time, it really didn't matter. I completed a bucket list race and I managed to work through some issues in the process. Every race is an adventure providing plenty of lessons, if one is willing to learn. Clouds were moving across the mountains at an incredible speed. If you have a bucket list, this race needs to be on it. Its location, scenery, climate, spectator support and race organization are second to none. Believe me, you will not regret it. 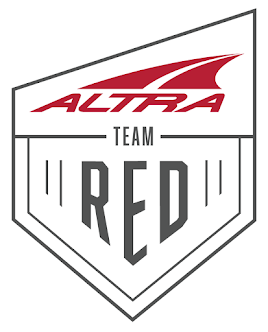 On a final note, I'd like to thank Altra Running, CEP Compression, Nuun Hydration and Honey Stinger for their continued support. Their products are a big part of allowing me to finish these awesome adventures. Entering the clouds once more. Hard packed trails were the exception. The never-ending sea of clouds. We went through various climates and the flora and fauna changed right along with it. There are numerous volcanic formations across the entire island. The GR131 trail cuts across the length of the island over nearly all of its highest points. The absolute beauty of this course makes this a true bucket list race. Clouds moving across the island. Rugged volcanoes all around us. Sometimes I had to remind myself to stop taking pics and start running. It's hard not to stop to take in the views. While it was cold in the early hours, the sun quickly warmed things up a bit above the clouds. Runners and trail putting the size of these volcanoes in perspective. GR131 trail winding across the volcanic island. Observatory near the highest point of the course. The town of Tazacorte serving as finish line for the marathon distance below. Runners had to drop straight down for about a mile to the marathon finish and ultra marathon checkpoint, 3 miles left to go. A dry river bed, part of the final 5K to the finish.